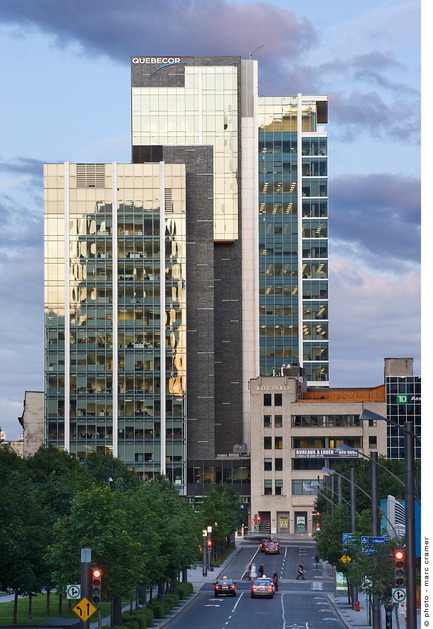 At the crossroads of Old Montreal, the Cité du multimédia, and the Quartier international de Montréal, Quebecor’s new head office is set in an architectural context punctuated by different eras. 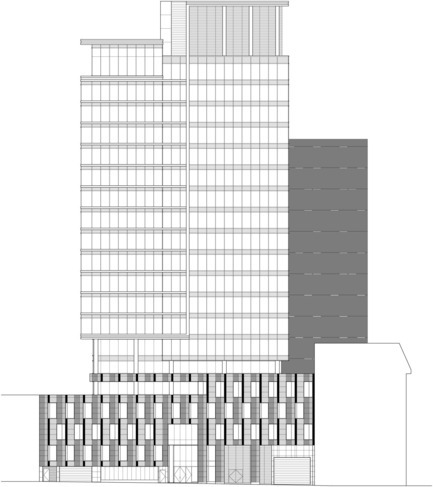 Formed of a four- and five-storey limestone-clad base that blends with the horizontality and materiality of Rue Notre-Dame, topped by a glass-wall tower that dialogues with the adjacent towers, the twenty-one-storey building is harmoniously wedded with a dense and relatively complex urban fabric. Seen from Victoria Square, the tower’s sharp, atypical silhouette matches the urban landscape. 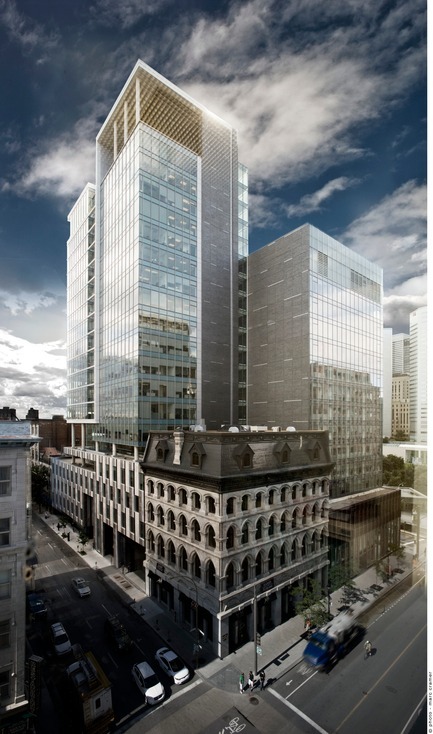 With façades both anchored to the past and turned toward the future, this architectural composition has brought balance, harmony, coherence, and relevance to a deconstructed street corner and contributes to the urban renaissance of this sector of downtown Montreal. 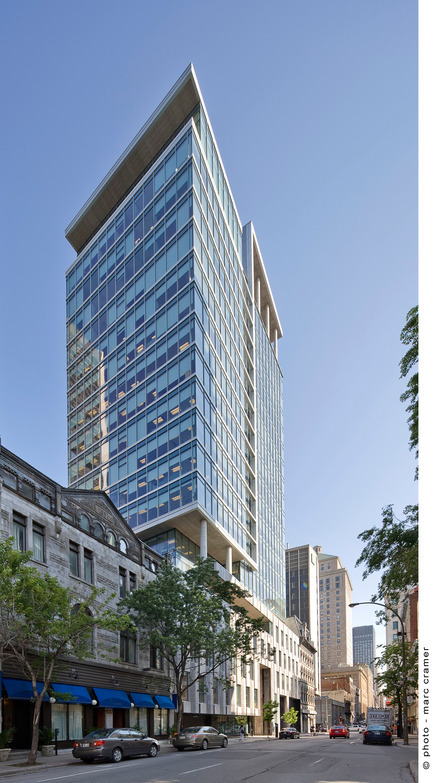 In 2006, Groupe Quebecor inc. decided to expand its head office at 612 Rue St-Jacques and erect a building befitting its leadership position in the communications sector. 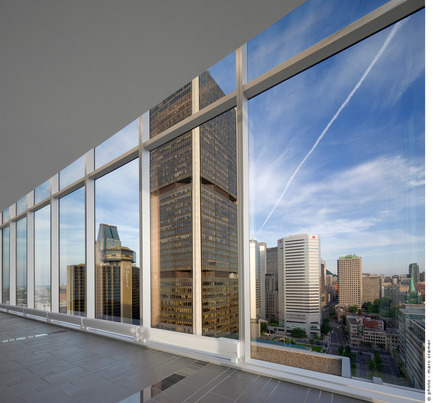 The original building, dating from 1962 and first constructed for Crédit Foncier Franco-Canadien, had undergone major renovations in the late 1990s, notably with regard to the important electro-mechanical elements, and the curtain-wall envelope had been completely redone. 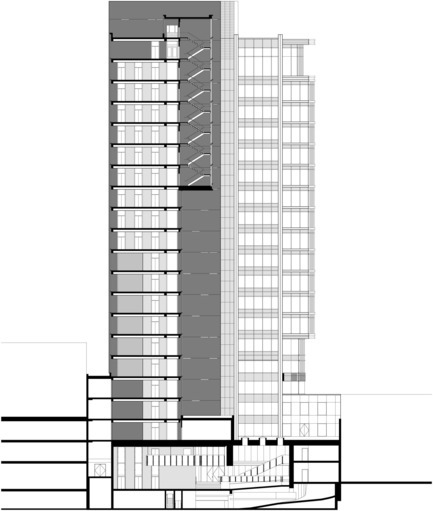 The present project involves an expansion of 170,000 square feet, spread over 19 storeys and two mechanical storeys, with the south side abutting the existing 13-storey building. 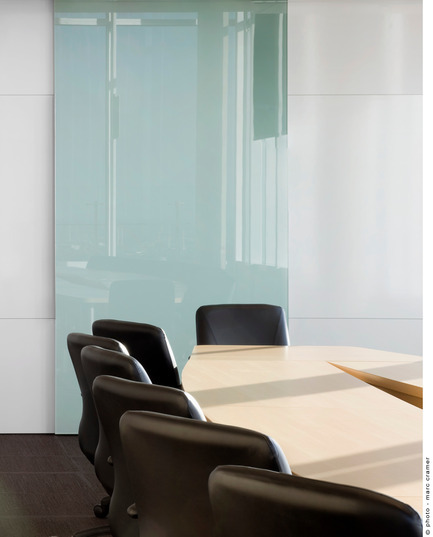 The client wanted an economical, simple project, in a context of performance, long-term value, and quality. 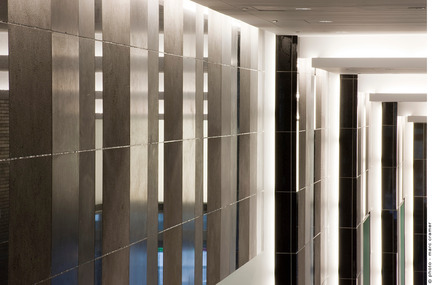 The original mandate required volumetry and exterior finishes that were perfectly integrated with the architecture of the existing building and its environment, as well as a tasteful, understated workplace promoting the wellbeing of employees, including the entrance hall and the areas occupied by upper management. 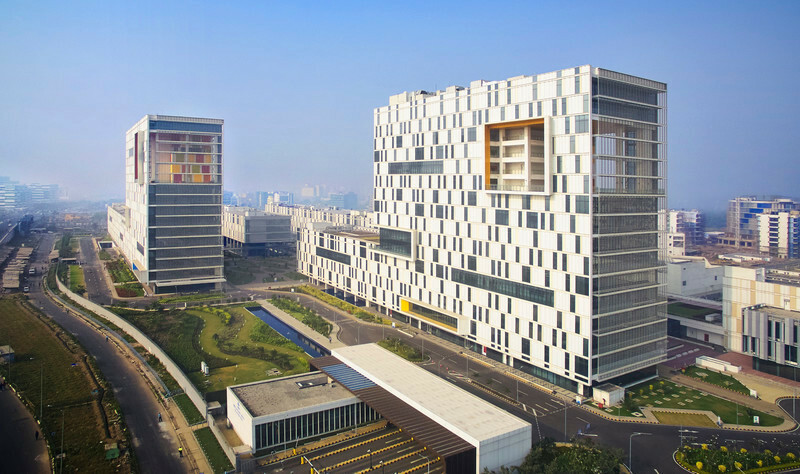 As the project evolved, it was suggested, among other things, that the crown of the building be exploited by creating prestigious spaces that were entirely open and flexible, to take full advantage of the spectacular views of the city. 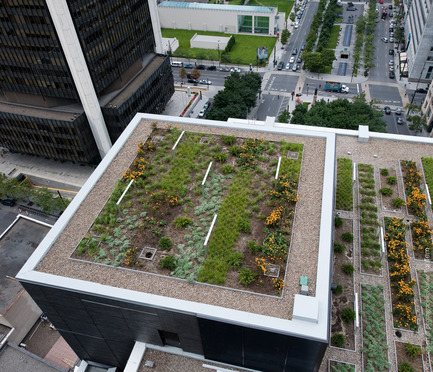 It was also advised that a green roof system be installed for the wellbeing of the building and the employees. 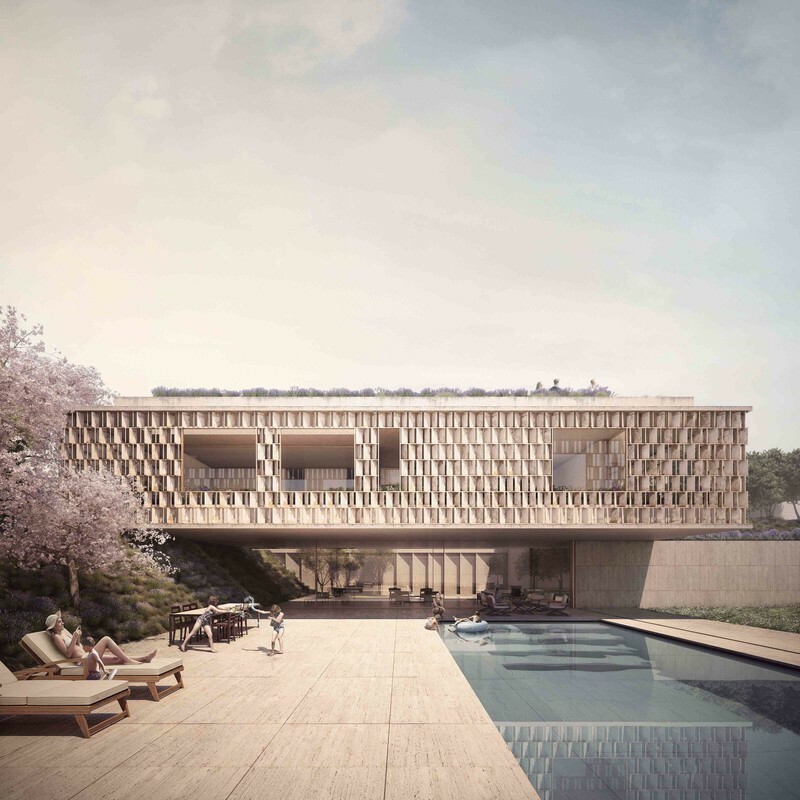 To achieve this project, three conditions seemed essential to the architects: the concept had to reconnect the building to the urban context and environment in every sense; the team had to adopt refined approaches to urban design and project management; and the project had to be accomplished based on the quality of the design and the materials. 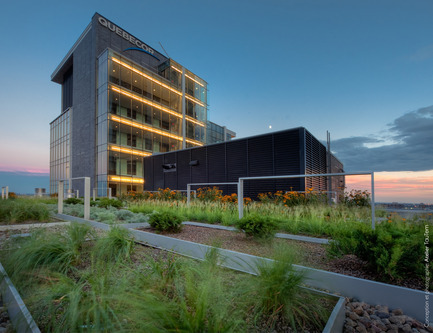 Quebecor’s new building was conceived with a concern for conservation and consolidation. 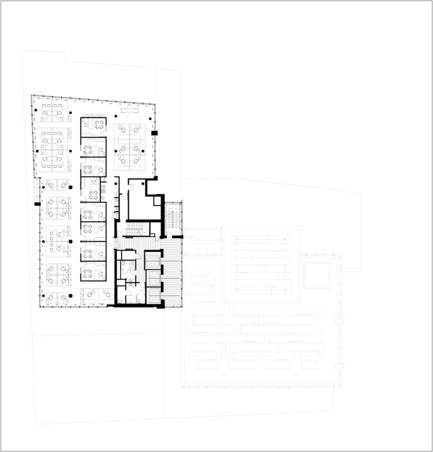 The idea of making full use of the structure of the existing building by grafting a second building in continuity with it was the beginning of a long series of principles that led the architects to think about their project around the concepts of recycling and reinterpretation of the existing architectural elements. 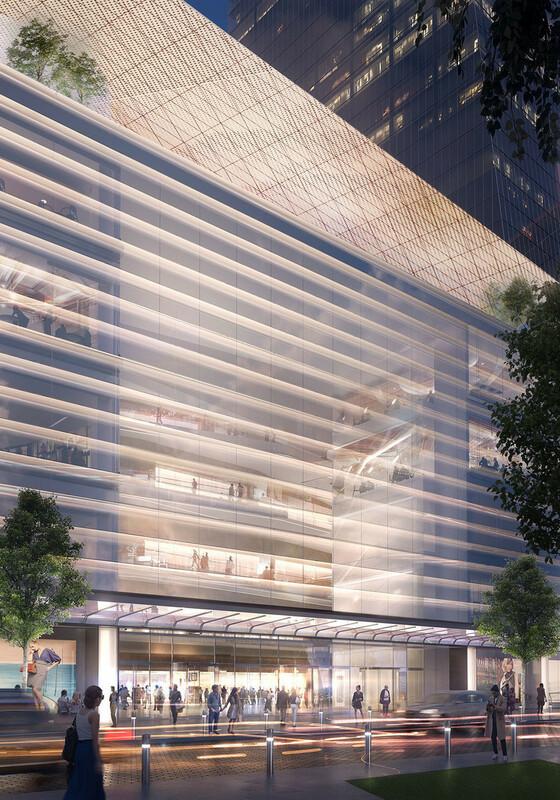 This dynamic of linking the two projects is very perceptible in the façade, in which volumes of glass, stone, and masonry stretch vertically, meeting or extending to the top. 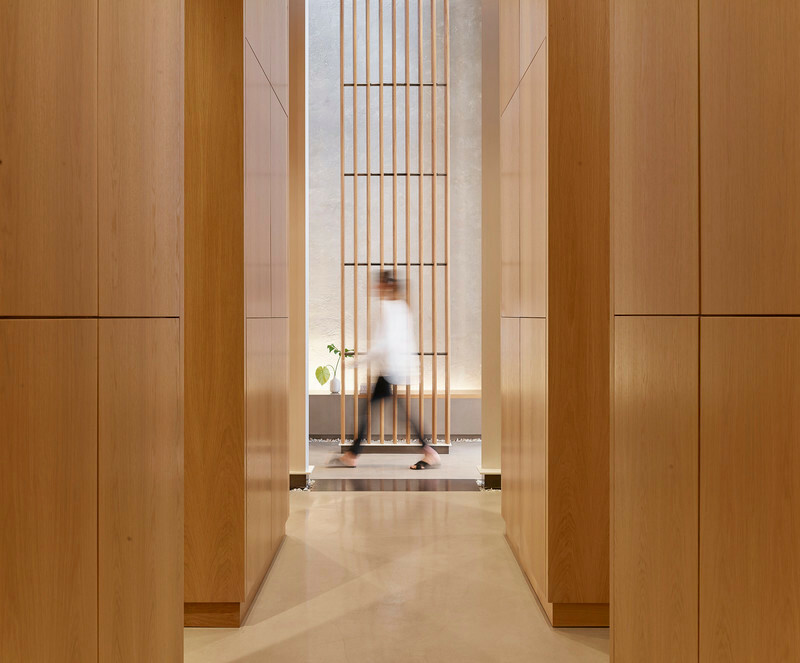 It is also very visible in the interior, as most of the materials used on the façade penetrate into the circulation spaces within the building, providing a subtle connection between the two buildings. 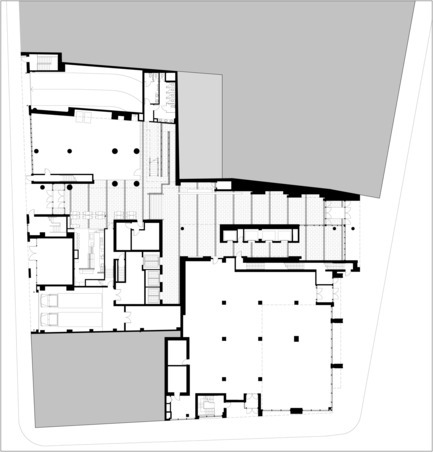 On the ground floor, this idea is conveyed by the creation of a new entrance hall that takes advantage of the relocation of the old parking-access ramp. Thus, a new two-storey-high public passageway crosses the block from one side to the other, connecting Rue Notre-Dame to Victoria Square. 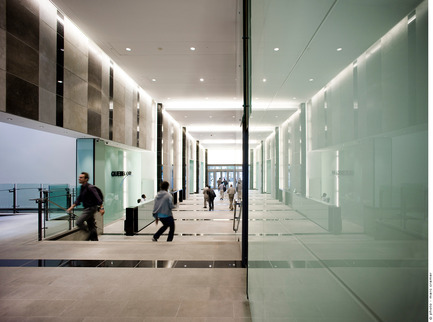 In its centre, a reception area formed of a long furniture wall of black granite faced with glass directs the public toward the vertical circulation and services spaces. 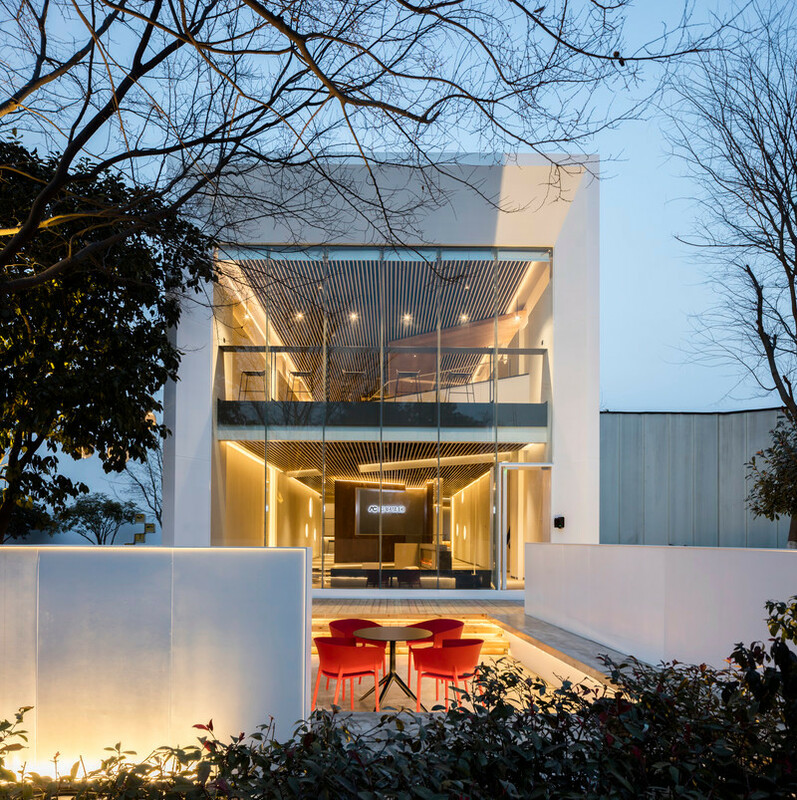 Designed for users, this element of the furniture integrated with the architecture accentuates the effect of horizontality, transparency, and airiness of the passageway. On the upper storeys, levels of circulation are created connecting the new circulation levels with the older ones by going through the black masonry wall on the south side, which has been opened up. 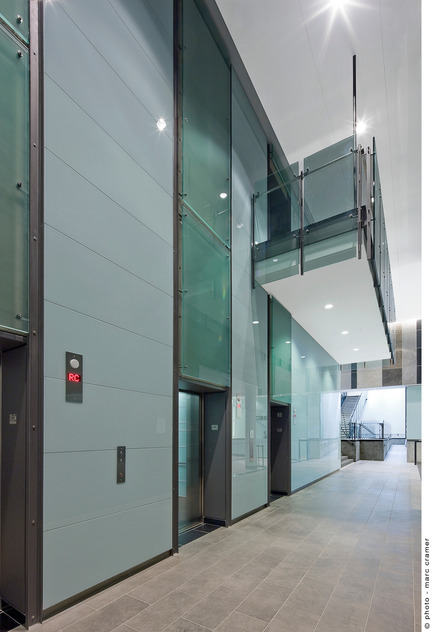 This link is conveyed by a living and elegant architectural detail: completely glazed passageways on fourteen storeys that interconnect the volume of ebonite black masonry, in which the new building’s elevators are hidden, with the halls and stairways of the existing building. 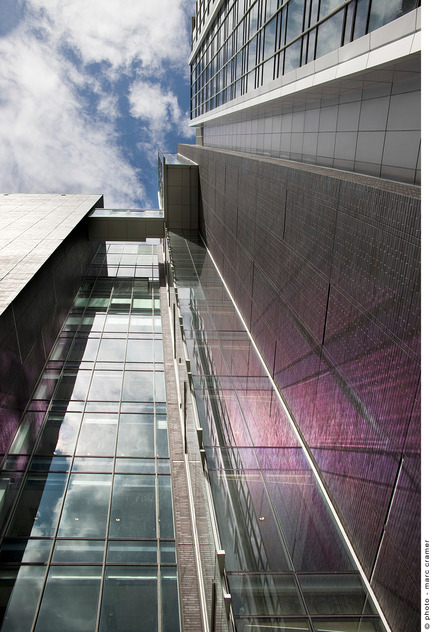 While the light reflects on the glazed surface of the linking nodule, the low-emissivity film on the glass reflects a rose-violet light onto the party-wall masonry, which warms the entire area. 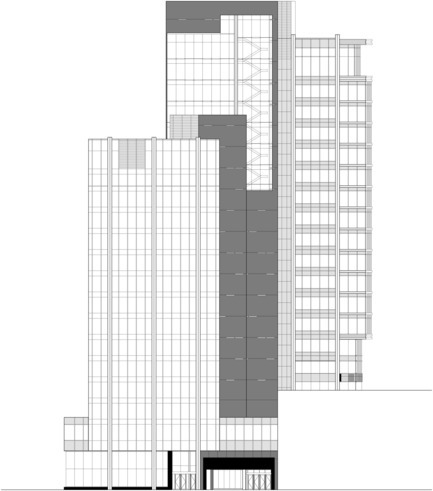 On the last seven storeys, a stairway rises above the glass volume to appear cantilevered over the new black-masonry wall, animating the vertical circulations on the main façade of the building. 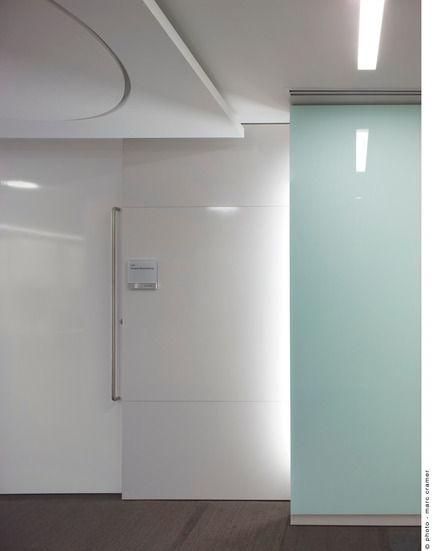 The materiality of the new building is in continuity with the existing building, endowing the grouping with homogeneity of colour and texture. 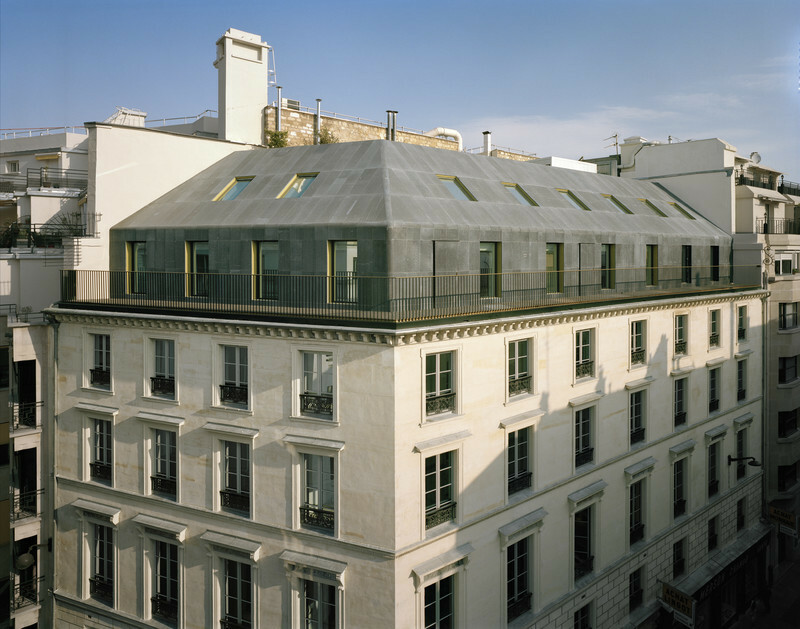 Both technological and organic in the landscapes that it generates, the skin of the building relates to the adjoining façades by the height of the floors, which respects those of the basilaire and existing storeys, notably on Rue Notre-Dame. 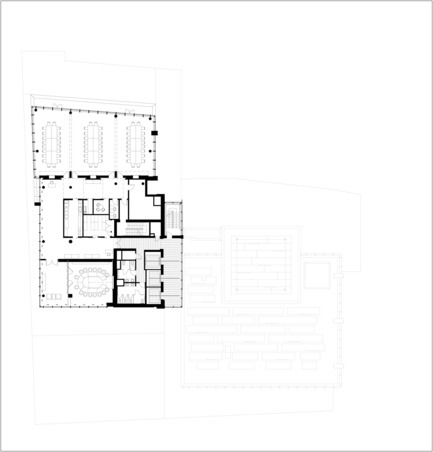 The uniformity of materials responds to a concern for the project’s urban integration by deliberately adopting a scale and typology similar to those of adjoining buildings, while having a language on the façade that is both contemporary and simple and highlights that of the old architecture through a play of contrasts. 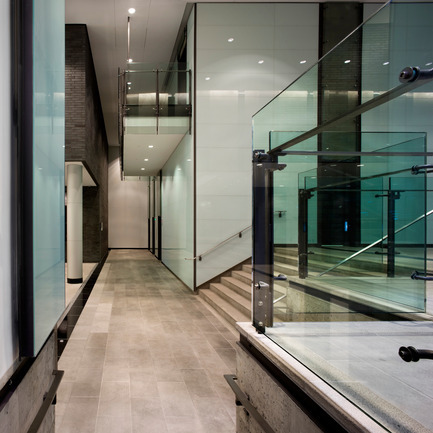 Limestone, black granite, glass, and aluminum are used to create a neutral-coloured link between neighbouring buildings with their variety of materials. 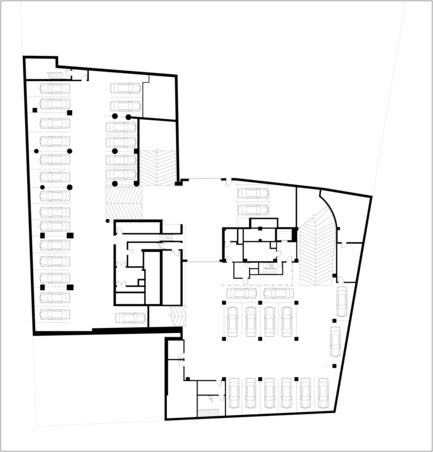 The ground-floor spaces blend through an open area while being clearly defined. 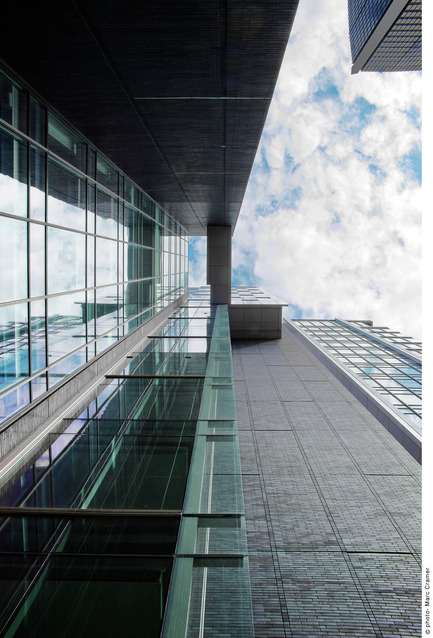 They communicate with each other visually and physically and are attached to the vertical circulation areas and the public passageway that are the pillar of the project. 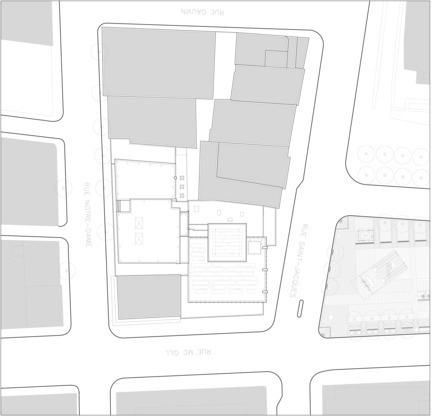 This spatial strategy offers cross-views from Rue Notre-Dame toward Victoria Square, contributing a horizontal fluidity. 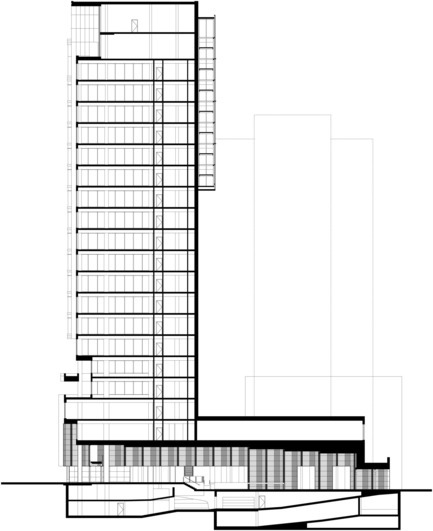 On the upper storeys, the spaces are designed for maximization of ventilation and functionally adequate natural light. 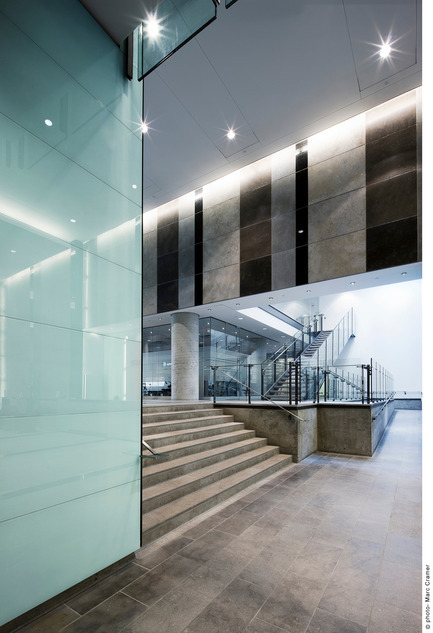 Within the building, the architects wanted to emphasize the verticality of the project by highlighting the volume of the stairway on a number of storeys, while giving it a theatrical aspect heightened by the use of glass panels and occasional lighting on either side of the stairway. This specific lighting horizontally covers the entire exposed part of the windowed connection. 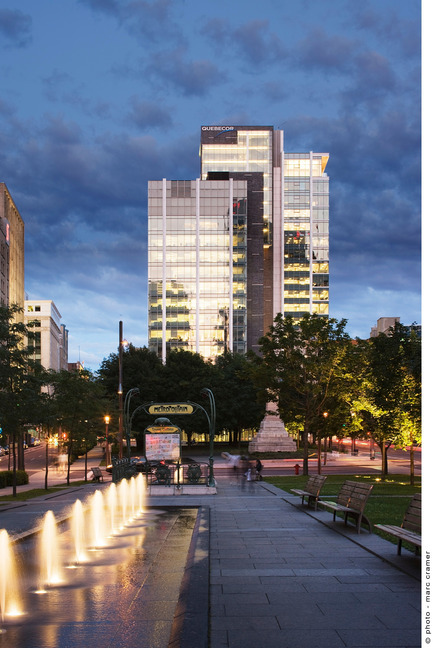 In the evening, the glass stairway, free of all adjacent buildings, forms a luminous signature that makes the building stand out on the south side of the square and is also visible from Boulevard René-Lévesque above. The grouping becomes very perceptible, bringing animation and interest, while offering a glimpse of the activities taking place inside. 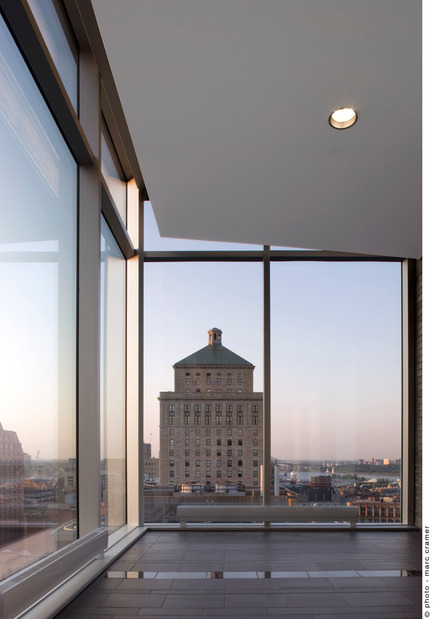 On the building’s 19th floor, the spaces as a whole having been treated with a concern for horizontal permeability, allowing a completely unencumbered view and giving everyone the opportunity to take full advantage of breathtaking views of downtown, Old Montreal, and the river. 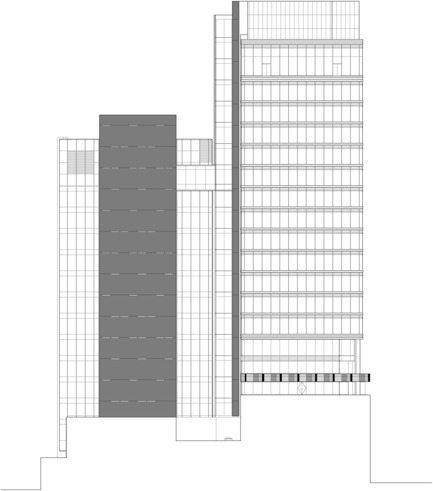 When visitors emerge from the elevator, they are somehow projected into the void with a view over Victoria Square and the towers of downtown opposite. 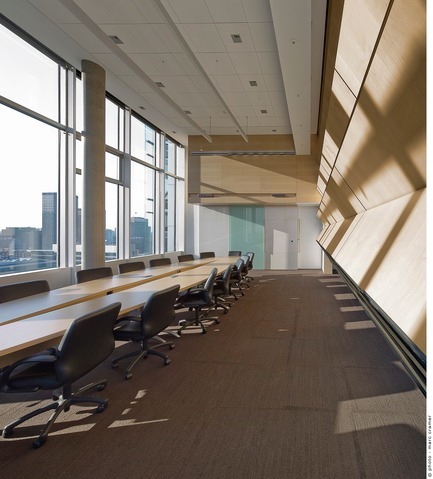 The immense multifunctional hall that takes up a large part of the 19th floor is equipped with acoustic separators integrated into the ceiling, which descend as needed and enable the hall to be modulated into one, two, or three spaces. 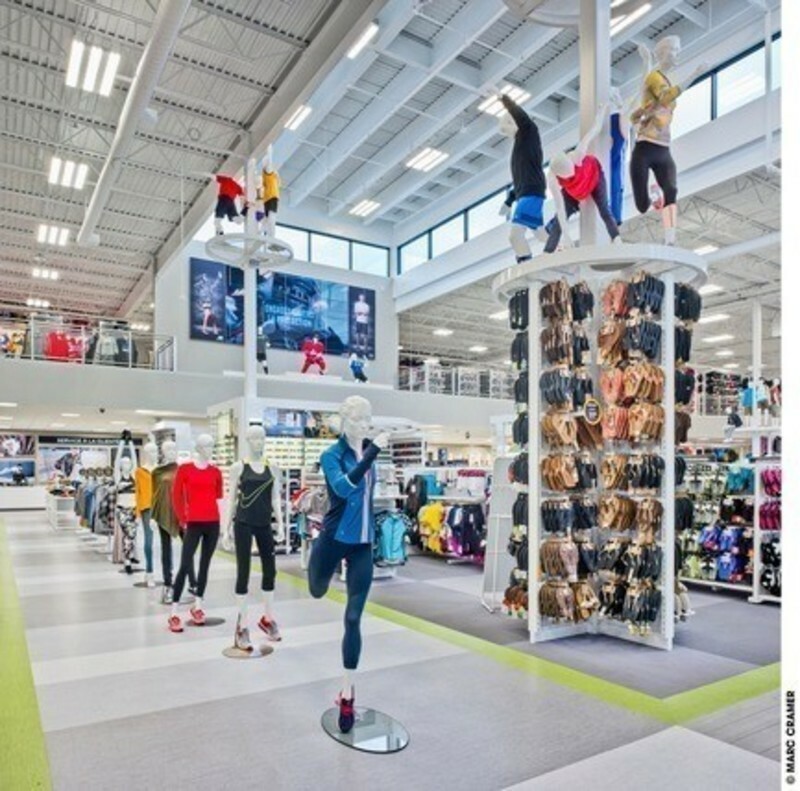 The height under the ceiling is 14 feet, and the volumetry and structure of the building’s crown have been deliberately left visible. 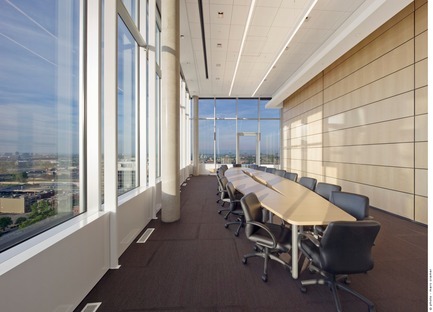 This hall also has is well equipped technologically for multimedia presentations and offers natural and artificial modulable light through opaque and translucent blinds that rise or descend. 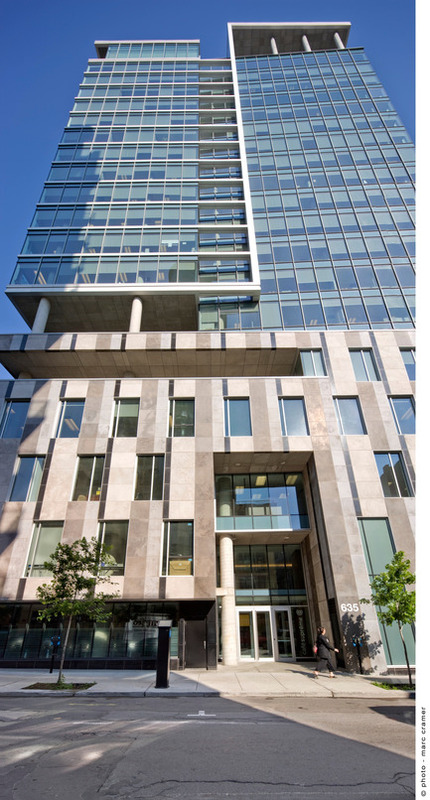 The decision to group all of a firm’s employees in a single workplace with adjacent public transit was the first principle followed with regard to the project’s sustainable development and accessibility. 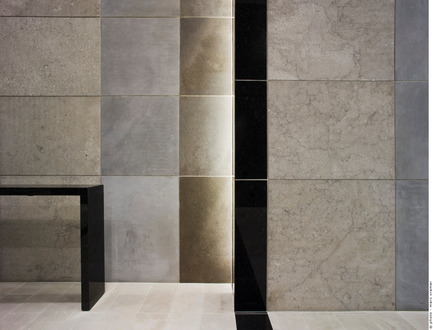 Then, the façade of the basilaire on Rue Notre-Dame is composed of St-Marc limestone, a local stone, prefabricated, then transported and installed on site. 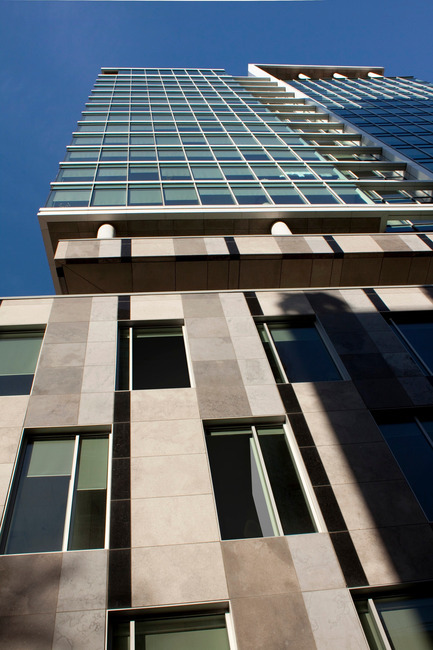 This construction technique considerably reduces cost and energy use, while increasing the speed of fabrication and installation of the façade materials. Finally, all of the windows were calibrated and sized according to orientation to take advantage of solar energy and avoid overheating. 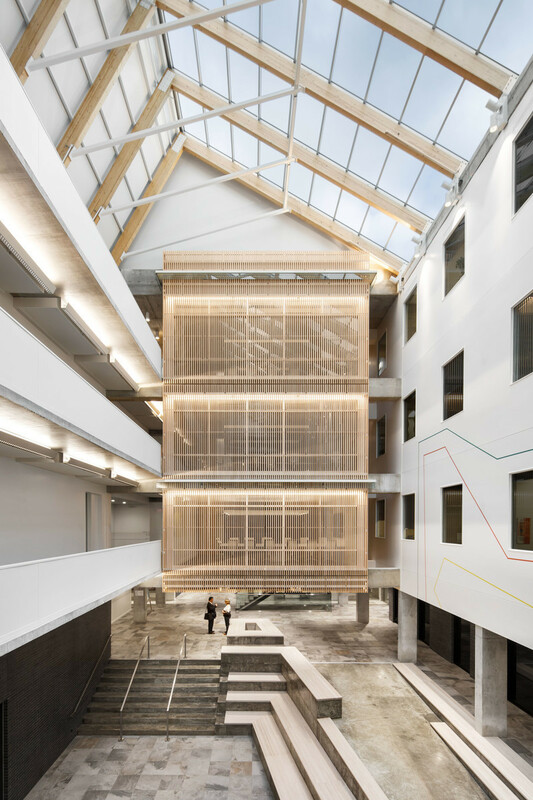 The architects paid particular attention to the quality and quantity of natural light penetrating into the building, organizing open-plan office areas as close as possible to the periphery where natural light is abundant. The designers initially thought of project’s evolution. 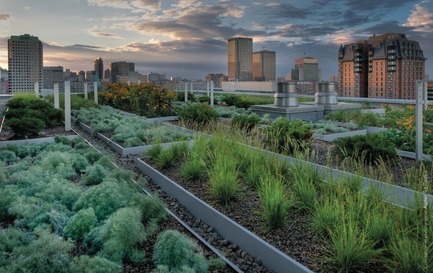 Originally, they included a number of green roofs to reduce the heat-island effect and manage rainwater. 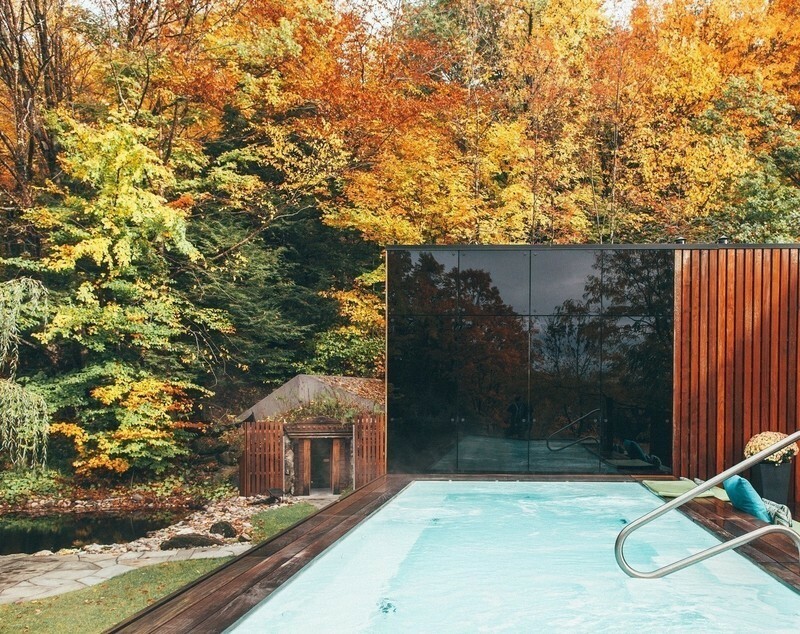 Although the idea was set aside due to budgetary constraints, it remained with the owner, who finally gave it the go-ahead as the project was being completed. 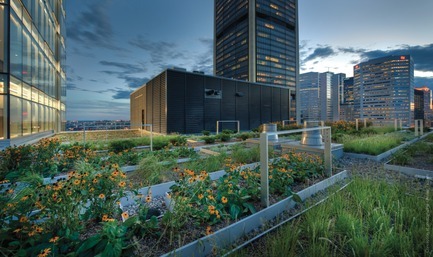 Located on the north tower at the fifteenth storey, the project’s green roof, the highest in Quebec, is overhung by six storeys of the south tower and is accessible from the elevator lobby on the 15th storey. 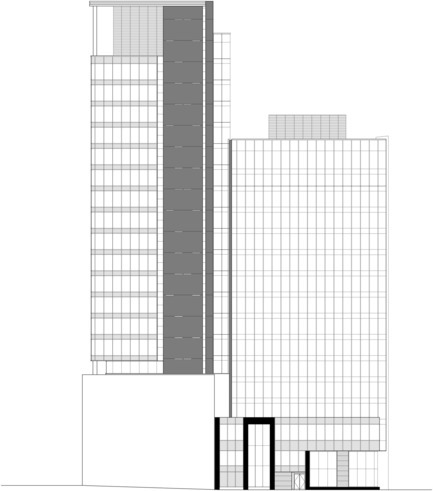 With downtown Montreal as a backdrop, the concept is in harmony with the composition of the tower. 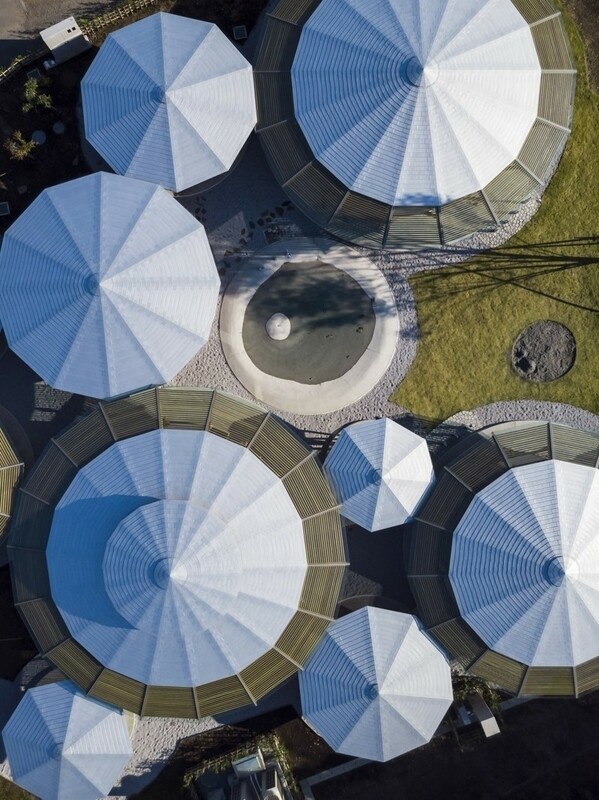 Very visible from the building, this garden in the sky retains rainwater, reduces urban heat islands, improves the lifespan of the waterproofing membranes, and encourages biodiversity. 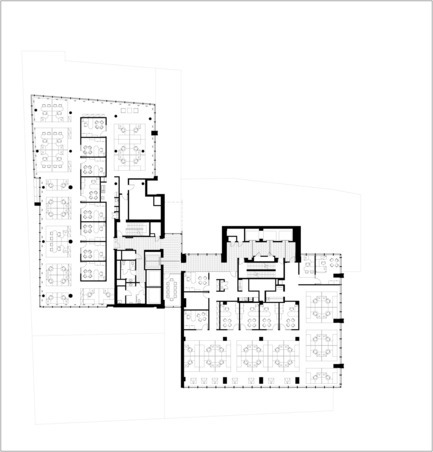 Finally, all of the spaces in the project were designed, from the beginning, as obstacle-free and universally accessible environments, so that people with temporary or permanent disabilities can move through the building, benefit from the greatest autonomy possible, and work in complete freedom and safety. 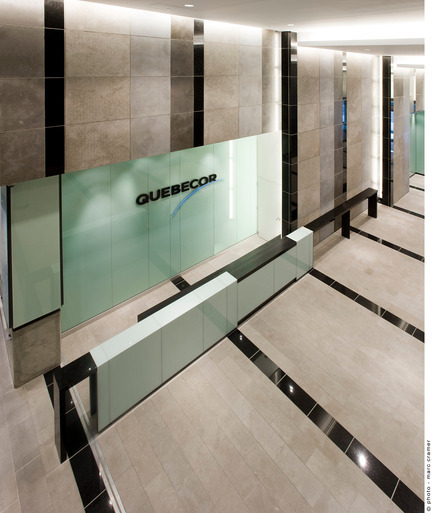 With all these details included in the design and execution, thanks to specific choices made by the architects, the Quebecor project respects a very defined urban context, while offering innovations and architectural quality that are highly appreciated by the workers and citizens who use the building.